Global FDI flows fall again in 2002 amid weak economic performance. Global FDI inflows declined in 2002 for the second consecutive year, falling by a fifth to $651 billion-the lowest level since 1998 (table 1). Flows declined in 108 of 195 economies (see figures 1 and 2 for the economies that experienced the biggest decline, as well as the top recipients). The main factor behind the decline was slow economic growth in most parts of the world and dim prospects for recovery, at least in the short term. Also important were falling stock market valuations, lower corporate profitability, a slowdown in the pace of corporate restructuring in some industries and the winding down of privatization in some countries. A big drop in the value of cross-border mergers and acquisitions (M&As) figured heavily in the overall decline. The number of M&As fell from a high of 7,894 cases in 2000 to 4,493 cases in 2002 – and their average value, from $145 million in 2000 to $82 million in 2002. The number of M&A deals worth more than $1 billion declined from 175 in 2000 to only 81 in 2002 – again, the lowest since 1998. For the largest transnational corporations (TNCs) most indicators of the size of their foreign operations declined slightly in 2001 (the latest year for which data are available), the beginning of the FDI downturn. 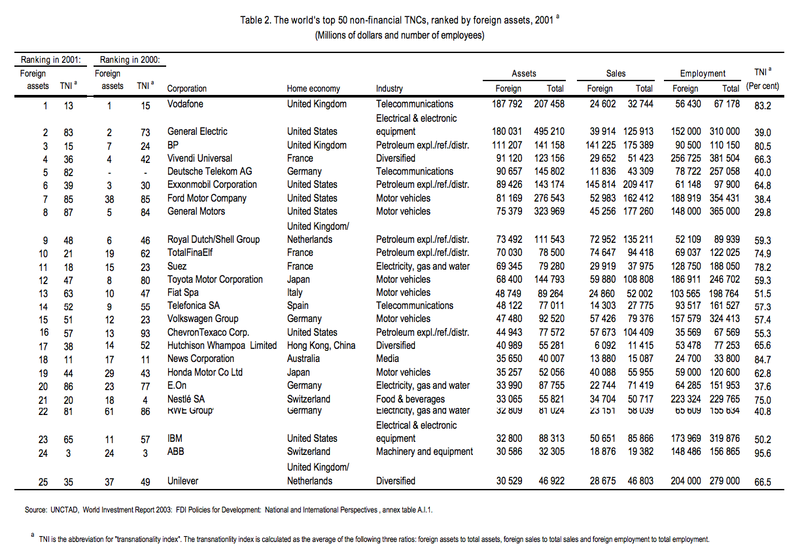 Despite the burst of the bubble in the information and communication technology market, there has been no significant shift in the industrial composition of FDI – nor in the ranking of the world’s top 100 TNCs (see table 2 for the top 25 of these firms), the top 50 TNCs from developing countries (see table 3 for the top 25 of these firms) and the top 25 TNCs from Central and Eastern Europe (CEE) (table 4). The decline in FDI in 2002 was uneven across regions and countries. It was also uneven sectorally: flows into manufacturing and services declined, while those into the primary sector rose. The equity and intra-company loan components of FDI declined more than reinvested earnings. FDI entering host economies through M&As went down more than that through greenfield projects. Geographically, flows to developed and developing countries each fell by 22% (to $460 billion and $162 billion, respectively). Two countries, the United States and the United Kingdom, accounted for half of the decline in the countries with reduced inflows. Among developing regions, Latin America and the Caribbean was hit hard, suffering its third consecutive annual decline in FDI with a fall in inflows of 33% in 2002. Africa registered a decline of 41%; but after adjusting for the exceptional FDI inflows in 2001, there was no decline. FDI in Asia and the Pacific declined the least in the developing world because of China, which with a record inflow of $53 billion became the world’s biggest host country. CEE did the best of all regions, increasing its FDI inflows to a record $29 billion. There was a sizable decline in FDI inflows to developed countries, accompanying a continuing slowdown in corporate investment, declining stock prices and a slowdown in the consolidation of activities in some industries – all influenced by weak economic conditions. In several countries, repayments of intra-company loans contributed to lower FDI flows. For instance, a large part of the decline in the United States was due to repayments of loans by foreign affiliates to parent companies, presumably to take advantage of the lower interest rates in the United States as well as for other reasons (such as improving the debt-to-equity ratio of parent firms). The most notable feature of the decline in FDI in the developed countries was the plunge in cross-border M&As, especially in the United States and the United Kingdom. In all, FDI inflows declined in 16 of the 26 developed countries. 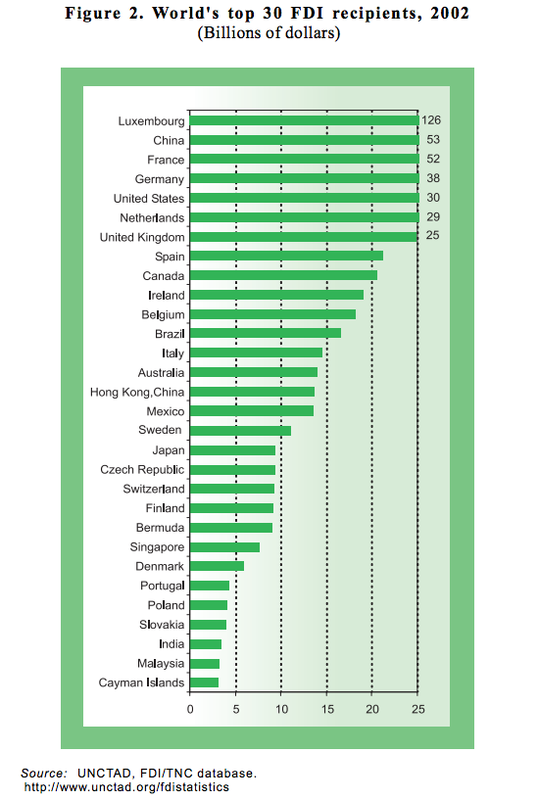 Australia, Germany, Finland and Japan were among the countries with higher FDI inflows in 2002. FDI outflows from the developed countries also declined in 2002 to $600 billion; the fall was concentrated in France, the Netherlands and the United Kingdom. Outflows from Austria, Finland, Greece, Norway, Sweden and the United States increased. In both outflows and inflows Luxembourg headed the list of largest host and home countries (for special reasons). The prospects for 2003 depend on the strength of the economic recovery, investor confidence and a resumption of cross-border M&As. With many TNCs continuing to follow cautious growth and consolidation strategies, M&As are not yet showing much dynamism. 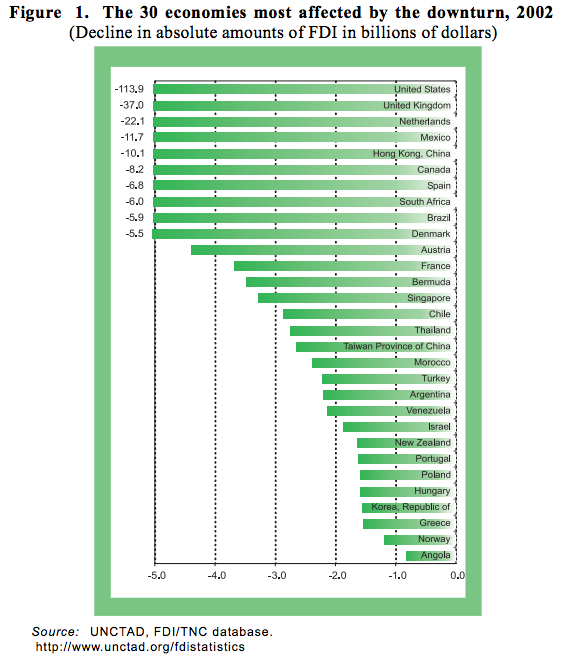 As a group,developed countries are not likely to improve their FDI performance in 2003. Africa suffered a dramatic decline in FDI inflows – from $19 billion in 2001 to $11 billion in 2002, largely the result of exceptionally high inflows in 2001 (two M&As in South Africa and Morocco, not repeated in 2002). Flows to 23 of the continent’s 53 countries declined. FDI in the oil industry remained dominant. Angola, Algeria, Chad, Nigeria and Tunisia accounted for more than half the 2002 inflows. Only South African enterprises made significant investments abroad. Oil exploration by major TNCs in several oil-rich countries make the 2003 outlook for FDI inflows more promising. The Asia-Pacific region was not spared, either, from the global decline in FDI inflows in 2002. FDI inflows to the region declined for the second consecutive year – from $107 billion in 2001 to $95 billion, uneven by subregion, country and industry. All subregions, except Central Asia and South Asia, received lower FDI flows than in 2001. Flows to 31 of the region’s 57 economies declined. However, several countries received significantly higher flows. Intra-regional investment flows, particularly in South-East Asia and North-East Asia, remained strong, partly as a result of the relocation of production activities, expanding regional production networks and continued regional integration efforts. FDI in the electronics industry continued to decline due to the rationalization of production activities in the region and adjustments to weak global demand. While long-term prospects for an increase in FDI flows to the region remain promising, the short-term outlook is uncertain. In Latin America and the Caribbean, FDI flows declined for the third consecutive year, from $84 billion in 2001 to $56 billion, affecting all subregions and 28 of the region’s 40 economies. Factors specific to the region contributed to this decline, especially the acute economic crisis in Argentina and economic and political uncertainty in some other countries. The services sector was affected most by the decline. Manufacturing FDI proved to be quite resilient, with barely any change, despite the slowdown from the region’s major export destination, the United States, and the growing relocation of labour-intensive activities to Asia. FDI is expected to remain at the same level in 2003 and to start rising thereafter. CEE again bucked the global trend by reaching a new high of $29 billion in FDI inflows, compared to $25 billion in 2001. That increase masked divergent trends, however, with FDI falling in 10 countries and rising in 9. FDI flows varied across industries as well, with the automobile industry doing quite well, and the electronics industry facing problems. There was also a tendency of firms (including foreign affiliates) in several CEE countries, particularly those slated for accession to the EU, to shed activities based on unskilled labour and to expand into higher value-added activities, taking advantage of the educational level of the local labour force. Led by a surge of flows into the Russian Federation, and fuelled by the momentum of EU enlargement, the region’s FDI inflows are likely to increase further in 2003. Of the two factors determining this trend, the surge of FDI into the Russian Federation seems to be more fragile in the medium and long term than the spur of EU enlargement. In the short term, however, both factors are helping overcome the impact of the completion of privatization programmes and the slowdown of GDP growth expected in some key CEE countries. UNCTAD’s Inward FDI Performance Index ranks countries by the FDI they receive relative to their economic size, calculated as the ratio of the country’s share in global FDI inflows to its share in global GDP. The Index for 1999-2001 indicates that Belgium and Luxembourg remained the top performer. Of the top 20 performers, 6 are industrialized, 2 are mature East-Asian tiger economies, 3 are economies in transition and the remaining 9 are developing economies, including three from sub-Saharan Africa. UNCTAD’s 1999-2001 Inward FDI Potential Index, measuring the potential – based on a set of structural variables – of countries in attracting FDI, indicates that 16 of the 20 leading countries are developed countries and four of them, mature East-Asian tiger economies. Many industrial, newly industrializing and advanced transition economies are in the front-runner category (with high FDI potential and performance), while most poor (or unstable) economies are in the under-performer category (with both low FDI potential and performance). Economies in the above-potential category (with low FDI potential but strong FDI performance) include Brazil, Kazakhstan and Viet Nam. Economies in the below-potential category (with high FDI potential but low FDI performance) include Australia, Italy, Japan, Republic of Korea, Taiwan Province of China and the United States. Prospects remain dim for 2003, but should improve thereafter. All in all, UNCTAD predicts that FDI flows will stabilize in 2003. Flows to the developing countries and developed countries are likely to remain at levels comparable to those in 2002, while those to CEE are likely to continue to rise. In the longer run, beginning with 2004, global flows should rebound and return to an upward trend. The prospects for a future rise depend on factors at the macro-, micro- and institutional levels. The fundamental economic forces driving FDI growth remain largely unchanged. Intense competition continues to force TNCs to invest in new markets and to seek access to low-cost resources and factors of production. Whether these forces lead to significantly higher FDI in the medium term depends on a recovery in world economic growth and a revival in stock markets, as well as the resurgence of cross-border M&As. Privatization may also be a factor. FDI policies continue to be more favourable, and new bilateral and regional arrangements could provide a better enabling framework for cross-border investment. Findings of surveys of TNCs and investment promotion agencies (IPAs) carried out by UNCTAD and other organizations paint an optimistic picture for the medium term. IPAs in developing countries are far more sanguine than their developed world counterparts. Developing countries are also expected to be more active in outward FDI. IPAs expect greenfield investment to become more important as a mode of entry, especially in developing countries and CEE. Tourism and telecom are expected to lead the recovery. Facing diminished FDI inflows, many governments accelerated the liberalization of FDI regimes, with 236 of 248 regulatory changes in 70 countries in 2002 facilitating FDI (table 5). Asia is one of the most rapidly liberalizing host regions. An increasing number of countries, including those in Latin America and the Caribbean,are moving beyond opening to foreign investment to adopting more focused and selective targeting and promotion strategies. Financial incentives and bidding wars for large FDI projects have increased as competition intensified. IPAs, growing apace in recent years, are devoting more resources to targeting greenfield investors and to mounting after-care services for existing ones. … as well as participation in more investment and trade agreements. More countries are concluding bilateral investment treaties (BITs) and double taxation treaties (DTTs), as part of a longer trend, and not solely in response to the FDI downturn. In 2002, 82 BITs were concluded by 76 countries, and 68 DTTs by 64 countries. Many countries are concluding BITs with countries in their own region to promote intra-regional FDI. Asian and Pacific countries, for instance, were party to 45 BITs, including 10 signed with other countries in that region. There has also been an increase in the number of trade and investment agreements. Many recent trade agreements address investment directly – or have indirect implications for investment, a trend conspicuously different from earlier regional and bilateral trade agreements. The largest number in developed countries were concluded by the EU, mainly involving partners in CEE and Mediterranean countries. The EU enlargement through the accession of 10 new members in 2004 and the forthcoming negotiations of ACP-EU Economic Partnership Agreements might also have an impact on FDI in the respective regions. In Asia and the Pacific, the number of such agreements has increased rapidly – to improve competitiveness, attract more FDI and better meet the challenges emanating from heightened competition. ASEAN is taking the lead. In Latin America and the Caribbean, NAFTA has been the most prominent example, leading to increased FDI flows especially into the assembly of manufactured goods for the United States market. The Free Trade Area of the Americas, now under negotiation, could expand market access, promoting efficiency-seeking FDI. In Africa, progress towards the creation of functioning free trade and investment areas has been slow, though several agreements, mostly subregional, have been concluded. AGOA (not a free trade agreement but a unilateral preference scheme) holds some promise for the expansion of trade and investment in the region. For the EU-accession countries of CEE, a policy challenge is to harmonize FDI regimes with EU regulations, with the twin aims of conforming to EU regulations and maximizing the potential benefits from EU instruments, such as regional development funds. Successful adjustment to EU membership in the accession countries will also depend on their ability to establish and develop the institutional framework required to administer and properly channel the variety of funds available from European Community sources for assisting economic development. The non-accession countries face the challenge of updating and modernizing their FDI promotion to optimize the potential benefits being on a ìnew frontier” for efficiency-seeking FDI – by attracting firms choosing to switch to lower cost locations within CEE. Converging patterns of FDI links and investment and trade agreements are generating mega blocks. 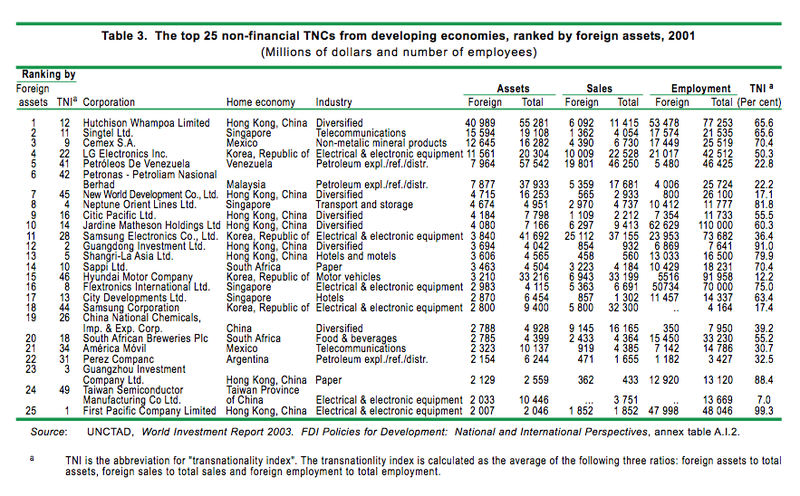 The global stock of FDI, owned by some 64,000 TNCs and controlling 870,000 of their foreign affiliates, increased by 10% in 2002 – to more than $7 trillion. Technology payments, mostly internal to TNCs, held steady in 2001 despite the near halving of FDI flows. Value added by foreign affiliates in 2002 ($3.4 trillion) is estimated to account for about a tenth of world GDP. FDI continues to be more important than trade in delivering goods and services abroad: global sales by TNCs reached $18 trillion, as compared with world exports of $8 trillion in 2002. TNCs employed more than 53 million people abroad. The developed world accounts for two-thirds of the world FDI stock, in both ownership and location. Firms from the EU have become by far the largest owners of outward FDI stock, some $3.4 trillion in 2002, more than twice that of the United States ($1.5 trillion). In developing countries, the inward FDI stock came to nearly one-third of GDP in 2001, up from a mere 13% in 1980. Outward FDI stocks held by developing countries have grown even more dramatically, from 3% of their GDP in 1980 to 13% in 2002. Over time, the concentration of outward and inward FDI in the Triad (EU, Japan and the United States) has remained fairly stable. By 2002 the pattern of DTTs was quite similar to the Triad pattern of FDI flows, while the pattern of BITs had a weaker resemblance. For both BITs and DTTs, the Triad’s associate partners (countries with more than 30% of their FDI with a Triad member – figure 3) score higher than non-associate partners. This suggests that the “economic space” for Triad members and their developing country associates is being enlarged from national to regional – and that treaties are making investment blocks stronger. The emerging nexus of mutually reinforcing trade and investment agreements may be providing gains for the developing countries that are “insiders” in such mega blocks. Global FDI flows fall again in 2002 amid weak economic performance. Prospects remain dim for 2003, but should improve thereafter. Government policies are becoming more open, involving more incentives and focused promotion strategies ... ... as well as participation in more investment and trade agreements. Converging patterns of FDI links and investment and trade agreements are generating mega blocks.